Join us for a fun night at Asolo Repertory Theatre on Tuesday, February 12th! 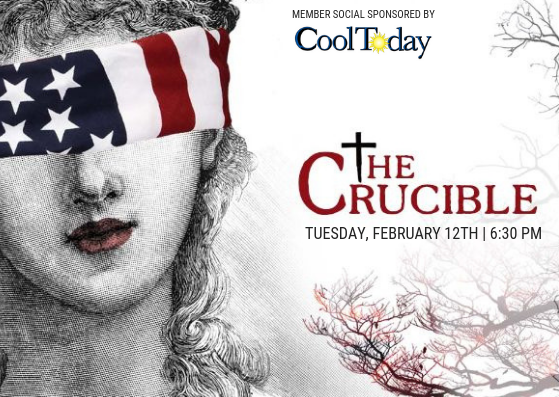 An hour before curtain call, members will enjoy cocktails and light bites, sponsored by CoolToday for a fun and purely social gathering. Spouses or plus ones are welcome, but RSVPs are required! Make your reservation below! In the black of night, a Salem village reverend discovers a group of teenage girls dancing devilishly around a fire in the woods. When his daughter exhibits strange catatonic symptoms the following morning, the townsfolk are frenzied with tales of witchcraft. Deep-seated jealousy and deadly accusations pit neighbor against neighbor and this God-fearing community is thrown into turmoil. With powerful notions of faith, truth and integrity burning as feverishly today as the day it was written, this 1953 Tony-Award winning masterpiece of the American canon is a must-see.